For the last few years, there are no two franchises occupying the same city that seemed to be any different than the Pittsburgh Penguins hockey franchise and the Pittsburgh Pirates baseball franchise. The franchises were like opposite sides of the same karmic coin - everything that could go right for the Penguins seemed like it did, and everything that could go wrong for the Pirates seemed like it did. In some ways it felt like the universe balancing things out - that somehow it would be unfair for the sports Gods to give a city so much. For every Sidney Crosby - selected #1 overall by the Penguins in 2005- there was a Brad Lincoln - selected #4 overall by the Pirates in 2006. For every Evgeni Malkin - selected #2 overall in 2004 - there was a Daniel Moskos - selected #4 overall by the Pirates in 2007. For every Ray Shero - the Penguins award winning master-mind General Manager with a penchant for making all the right moves - there was a Dave Littlefield - the Pirates GM who seemed to botch almost every single significant decision he made during his disastrous tenure in Pittsburgh. For every moment of glory - like the Penguins raising Lord Stanley's Cup in 2009 - there was a soul-crushing moment - like the Pirates heart-breaking historic collapse of 2012. While the last few years have been tremendous for the Pittsburgh Penguins, it wasn't that long ago that the mighty Pens had a lot more in common with the struggles of the Pirates. It's easy to forget that but for the good fortune that landed the Penguins the first overall pick that became Sidney Crosby, that but for the intervention of the Godfather of Hockey in Pittsburgh - Penguins owner Mario Lemieux - the Penguins might not even be playing hockey in the Steel City. Today, as the Pittsburgh Pirates and their fan base - myself included - celebrate the clinching of their first post-season appearance since 1992, Pittsburgh Penguins fans should celebrate too. The Pirates, like the Penguins in the post-Crosby era, seem to have finally turned a page. The Pirates are good for baseball and good for the city of Pittsburgh. 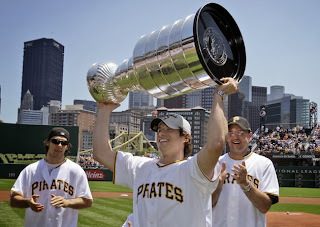 The Penguins fan base remembers what it was like to struggle, remembers what it was like to be a once proud franchise on the ropes, which is exactly why Penguins fans - whether they are baseball fans or not - should celebrate the success of the Pittsburgh Pirates.